When we set out to create the list of Melbourne's best Thai restaurants, we were determined to find the best pad thai in the entire city, even if it cost us our BMIs. Seventeen-or-so yellow curries later we present to you this list of coma-inducing hotspots. Each one has been wok-fried, topped with crushed peanuts and served with a smile. Here are Melbourne’s best Thai restaurants. Sitting pretty on Bridge Road is modern Thai oasis, Ladyboy. This Melbourne hotspot specialises in a bunch of cheeky cocktails that go down swimmingly with a mouthful of roti bread. Broken down into smaller munchables, bigger share plates and the sweet stuff, there’s a little something for everyone. We recommend the ‘authentic old-school pad thai’ and the crispy-fried Gai Tod chicken, plus the signature dessert ice-cream sliders served on warm brioche (hullo heart attack, here I come). Folks flock from near and far to wrap their lips around the goods on Chin Chin’s menu, and who can blame them? It’s only (quite possibly) the best modern Thai in the entire city. After a recent facelift, the place is looking just as good as the food (and the food’s bloody good). Dishes worth phoning home about include the old and gold pad thai, the rendang wagyu beef curry and the corn and coriander fritters. There’s also a host of other delicious Asian dishes, so don’t feel like you have to restrict yourself to just delicious Thai. (Or if you can’t decide what you want, just go for the $70 'feed me' option). Dodee Paidang first made their presence known up in Sydney, but they've now set up shop on Little Collins St (and Melbourne's pretty happy about it). The focus is on street food, showcasing bold and inventive flavours from around Thailand. There are countless noodle soups to choose from, including variations on the classic tom yum, or you can try some of the Moo Ping pork skewers you see customers scoffing down around you. Check out their range of Thai breakfasts too. Time for a trip to the 'burbs with this one. Over in sleepy Mount Waverley you'll find Mango Tree Thai, offering up simple and delicious Thai without any of that inner-city glam. As you'd expect, the Pad Thai is a winner, but don't skip the Pad Makeua for something a little different from your usual order: wok-fried eggplant with minced chicken or pork, chilli and Thai basil to round it all out. The whole fried barramundi with sweet, spicy sauce is a winner too. Right in the heart of Fitzroy, on Brunswick street, is this melting pot of Thai and Vietnamese fusion. It boasts a fab selection of small and large serves of street food that’ll curb your Thai craving no worries. Infused with modern methods, Rice Paper Scissors is the perfect lunch or dinner destination, thanks to its share-friendly menu (and not to mention its famous crispy pork). Perched on Ferguson Street in Abbotsford, Jinda Thai has been famous for its incredible service, venue and cuisine since it opened its doors in 2013. Everything is fresh and flavoursome, plus the serving sizes are generous and everything’s affordable (for a refreshing Melbourne change). Best dishes include soft-shell crab on a green papaya salad, traditional pad thai, and authentic hawker boat noodles. For something a little different, try these meals on wheels. Farang Thai boasts a Northern Thai Isaan BBQ cuisine, which is essentially marinated, char-grilled meats, sticky rice and som tam salad with a few other delicious “hard to find” dishes from Chiang Mai and the country's Northern regions. Something else that’s hard to find is the food truck itself which can be found at various rotating locations throughout the year. To find out where they are next, keep an eye on their Facebook page. There’s nothing to worry about when it comes to this new Son In Law. It's a hub of Insta-worthy culinary feasts, featuring all of your Thai street food favourites, plus a few that push the boundaries of what is considered 'food'. 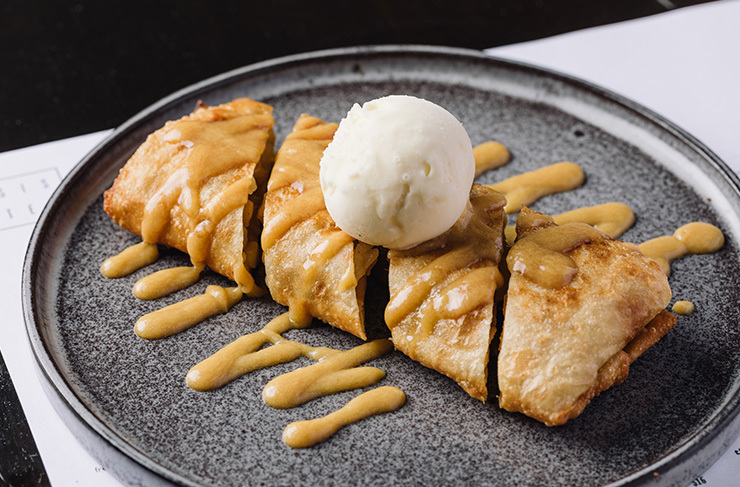 Classics include the Pad Thai with charcoal noodles and the Tom Yum soup noodle, and fusion dishes include the crispy soft shell crab and tiger prawn green Thai curry and braised beef tacos. Whether you’re a diner of tradition or an adventurous eater, there’s something for everyone (and it’s all bloody delicious). 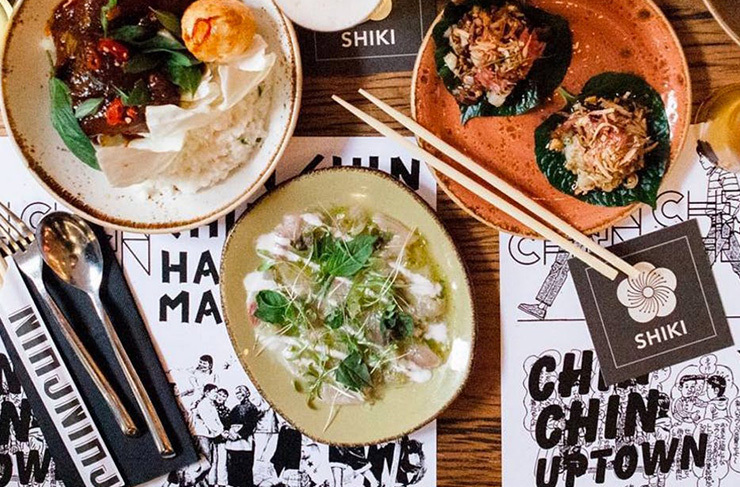 We're all familiar with Rooftop Bar on a Friday evening in Summer, but head just downstairs and you'll find some of the best Thai food in Melbourne at Cookie. Amongst a whole bunch of funky cocktails (try the French Flip) you can polish off some steamed fish dumplings with pickled cucumber, a zesty salmon, avocado & pomelo salad served with lemongrass and ginger, and of course a bloody good pad thai. Located in quiet Kensington, this cosy little cafe is the West’s go-to Thai institution. Highlights on their menu include the cashew chicken and the green curry, although it’s rude not to scoff one or six of their famous curry puffs. The entire menu is available online for pickup and delivery, but Pimm Thai is one of the coziest and most romantic spots around, with cushion-filled booths against both walls. Bets to do this one in person. Contemporary Thai dishes cooked with modern techniques are key at Chalawan, so don't come hoping for straight-up, authentic dishes. What you'll get is (arguably) even better. Give the beef fondue, smoked chilli jam, shallot and lemongrass a shot to kick things off, and chase it with the 10-hour braised beef cheek greeny curry rambutan, Thai eggplant and chilli. Expect a big flavour kick. 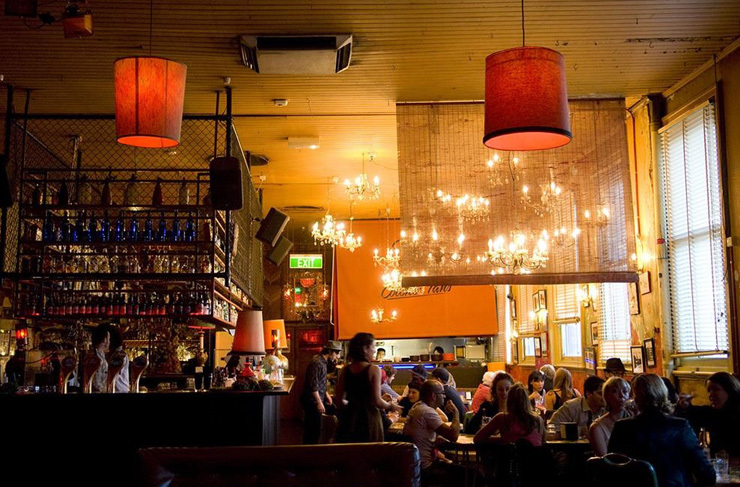 Fun fact, when Revolver isn’t Revolver, it’s actually Colonel Tan’s—one of Melbourne’s best Thai restaurants. Open from 5pm Tuesday through to Saturday (and 12pm on Fridays), this dance space is home to an eclectic collection of mismatched furniture and kitsch tables, plus it rocks an extensive and affordable Thai menu. Don’t leave the venue without trying the yellow sweet potato curry, the popcorn chicken and the sweet potato and cashew dumplings. Just like Cookie, you'll find a classic combo of inventive cocktails and punchy Thai flavours when you step into Magic Mountain Saloon (I mean, they do have the same owner after all). Anything you order is going to be damn delicious but do yourself a favour and order the "Magic Mountain BBQ Chicken", served with hot tamarind sauce and fried shallots. Then some snapper and green papaya, yellow curry and acacia pancake. And of course you don't wanna miss the pumpkin and coconut creme brulee. Yep, you've got a great range of cocktails and top-notch Thai food here too. 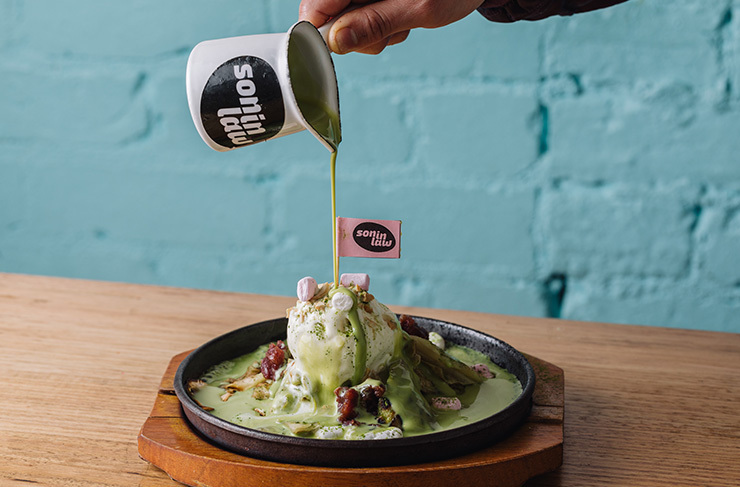 There does certainly seem to be a pattern in our picks...Head to Rock Sugar in South Yarra for some of the best modern Thai on offer—and the famous fairy floss martini. Make your own selections from the menu or take the stress out and go for the full dinner banquet. 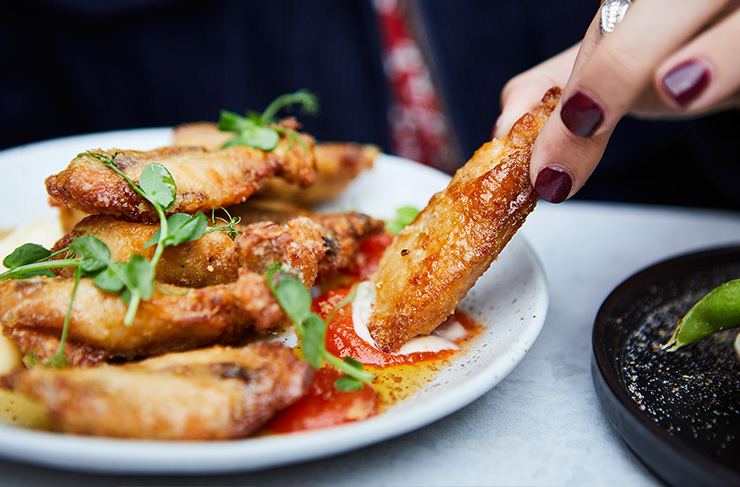 Think crispy fried chicken ribs with red nam jim, lemongrass and chilli caramel, a revolving curry selection, Thai spiced edamami and so much more deliciousness. Not a fan of meat? There's a mouthwatering vegetarian menu too. Solid flavours aren't the only South East Asian delights you'll find at Village People Hawker Hall, but they're definitely a highlight. Expect plate-licking stuff like caramelised tofu and peanuts on fresh pineapple, sweet potato curry puffs with curry leaf and poppy seeds, and Southern Thailand fried chicken with sweet chilli sauce and warm sticky rice: find us something better, we dare you. Okay, chances are you've heard of this one. Tom Phat has a big reputation in Melbourne for their punchy flavours and vibrant dishes—and rightly so. You could pretty much close your eyes and hope for the best when it comes to the menu (it's all good), but our tip is the duck leg braised in lemongrass, galangal, chilli and coconut, and then chargrilled and served with tomato and eggplant sambal. Or go vegan and grab the nasi mesantan— red coconut rice with tofu and tempeh fritters and eggplant chilli sambal. Yeah, uh, wear loose pants for this one cos you're gonna wanna try one of everything. We couldn't leave out David Thompson's Southbank Thai bunker could we? That guy is low-key terrifying, but damn he knows his way around a pad thai (we love you David). The pad thai at Long Chim is the proper stuff: heavy on the fish sauce, and a toally different texture than the noodles from your local takeaway. 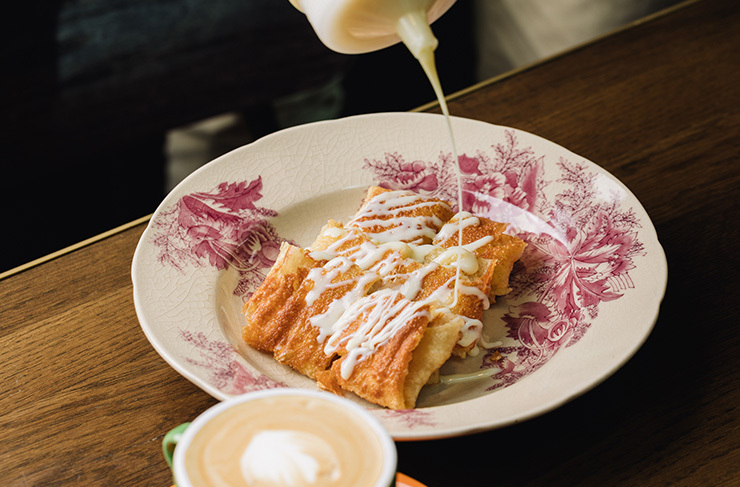 Don't miss the signature banana roti either—still one of the simplest (and most delicious) desserts in Melbourne. Looking for a good feed in the CBD? Here are the best restaurants that can be found inside the Hoddle Grid.